Watford u16As travelled to Whitgift to play Basildon and Chelmsford on Sunday 23rd November. The first match against Basildon started well,with a quick goal from a man-up.Basildon equalised,but 4 goals from Louis and 2 from William Keegan countered the 3 penalties scored by Basildon and resulted in a 6-4 victory for Watford. The second match was against Chelmsford.Seven goals from Louis and a penalty by Will Sammons,as well as good defensive work led to a well-earned 8-5 win. Thanks to coach Edi and the travelling band of supporters. U14s start the London Winter league season as (we hope) they mean to go on. 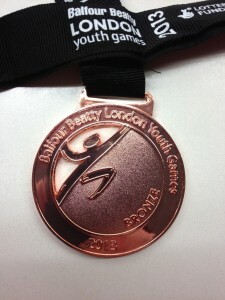 Yesterday at the London Youth Games at Crystal Palace – Europe’s largest youth sports event – the Barnet team came third, narrowly missing a place in the final. For Barnet, read Watford. The players are from Watford; Steve Chambers, the coach, is from Watford; the magnificently efficient Team Manager, *ahem* me, is also from Watford; as were the polo hats. An email did go out, but just in case you missed it, we have had to cancel this Monday’s training session at Borehamwood as The Venue have decided to close the pool early due to the Bank Holiday. Apologies for the late notice and all other training as normal. The fixtures live site is currently having issues, so our results pages aren’t working. Normal service should be resumed as soon as they can fix the problem with fixtures live.